1. Heat the grill or barbecue to medium; cook the burgers for 12-14 minutes, turning halfway, until cooked through. For the last 2 minutes, top the burgers with the camembert so it melts. Toast the buns in a dry frying pan. 2. Meanwhile, bring a pan of water to the boil and blanch the kale for 1 minute, until bright green but not too soft. Drain in a colander and rinse under cold water, then squeeze out the excess water. Whizz in a food processor with the pine nuts, parmesan and oil; season. 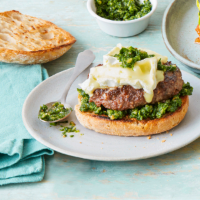 Spread the bottom halves of the buns with the pesto, then top with a burger, a little more pesto and the other half of the ciabatta bun.